Dr. Brad Gregory from the University of Notre Dame delivers the plenary address at the symposium. Luther College concluded the events commemorating the 500th anniversary of the Reformation with a symposium held on Oct. 31 titled “The Reformation of Everything.” The symposium invited past and current faculty, students, alumni, and guest speakers to present on topics related to the Reformation. Students had no classes so that they could attend events. The event started with the opening convocation featuring University of Notre Dame Professor Brad Gregory. Gregory is the author of “Rebel in the Ranks,” a recently published book that explores the Reformation and its lasting impacts. Gregory’s lecture was divided into four distinct parts: Martin Luther as a reluctant rebel, the early German Reformation, how the Reformation defined a troubled era, and the Reformation’s impact on modernity. Gregory, as a Catholic, neither celebrated nor denounced the Reformation but simply analyzed the Reformation and its impact. 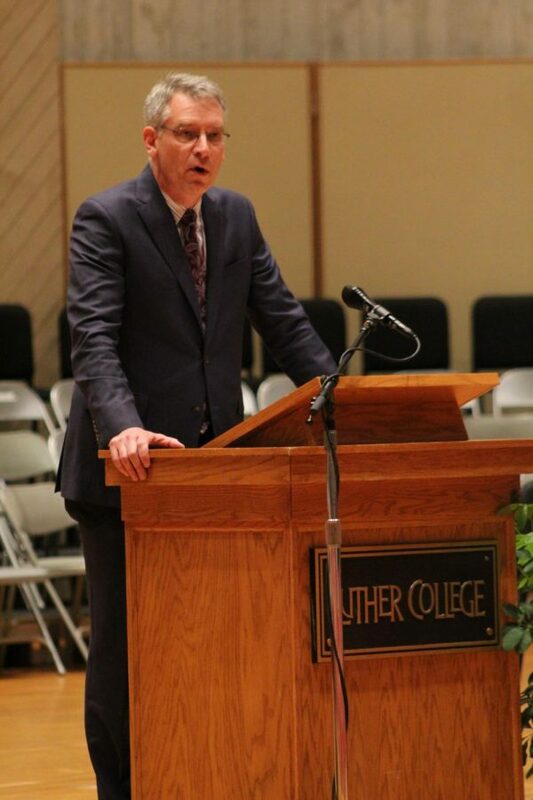 According to Associate Professor of History Robert Christman, the purpose of Gregory’s lecture was to present a thesis on how the Reformation impacts us today and offer a view of the Reformation outside of Protestantism. Gregory focused was on the secularization of society and the privatization of religion in daily life because of the Reformation. Essentially, Gregory argued that the Wars of Religion and religious persecution of the era were due to the Reformation splintering Christianity. According to Gregory, when people got tired of this constant conflict, they sought to create society off something other than religion. This allowed consumerism to become a ruling aspect of Western society, as the U.S. and England followed the example of the mercantile, radically tolerant Dutch Republic. Religion’s presence in the private sphere of life, the disagreement among Christianity, and secularized society (i.e. separation of church and state), can be linked back to the Reformation. Attendee Alexis Olson (‘20) enjoyed Gregory’s lecture, but found that his point was lost in the sheer amount of background information. After the convocation, around 30 presentations followed in two sessions. Topics included beer brewing practices of the Reformation era, lay religion, and Islam and the Reformation, to name a few. Samuel Scheidt (‘18), who was also a speaker on ecumenism in the symposium, believes having an event like this is important to increase understanding and the drive to find the truth. Moving forward, Christman hopes that the event will generate more conversation about the role of religion in society, as the Reformation was a critical point in Western Christianity.